New Zealand pop star Lorde is stepping up her role in the Hunger Games franchise, having revealed that she'll not only be contributing a new single to support the film franchise's The Hunger Games: Mockingjay — Part 1, but she'll be curating its accompanying soundtrack release. The film itself is set to hit screens November 21, while the soundtrack is fit with a loose fall launch date via Republic Records. 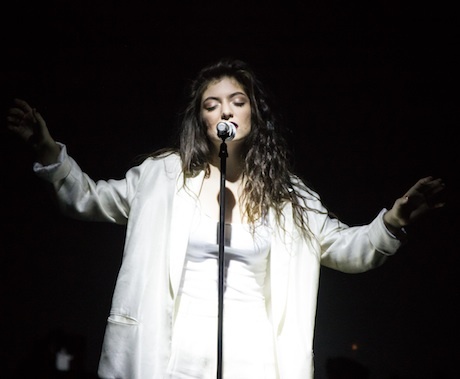 Despite there being slim info on who else is on the soundtrack, Lorde has hinted that she made some left-field choices for this upcoming instalment. "Curating the soundtrack for such a hotly-anticipated film was a challenge, but I jumped at the chance," she said in a statement. "The cast and story are an inspiration for all musicians participating and, as someone with cinematic leanings, being privy to a different creative process has been a unique experience. I think the soundtrack is definitely going to surprise people." No further info has been delivered on what Lorde's own musical contribution will be, or if we can expect to hear it ahead of the soundtrack's official release. This marks the second time the Kiwi artist has attached herself to The Hunger Games, as she submitted a cover of Tears for Fears' "Everybody Wants to Rule the World" to last year's The Hunger Games: Catching Fire soundtrack. Previous artists to have appeared on the Hunger Games soundtrack include the National, Sia, Coldplay, the Weeknd, Diplo, Arcade Fire's Win Butler and Regine Chassagne, the Decemberists and Taylor Swift.